Jetting off to an exotic location halfway around the world can be exciting. And even a quick jaunt across the country to visit friends provides a fun little break from your regular routine. But with a beautiful vacation comes the ugly truth: jet lag. It happens to all of us. That groggy, dizzy, don't-know-where-I-am-or-what-day-it-is feeling. Jet lag is the bane of many a traveler's existence. If you're constantly crossing time zones (or if you only make the occasional airplane journey), you don't have time to waste feeling like a zombie. Adopt these top tips and tricks to hack even the fiercest of time zone changes when traveling the world so you can have a restful and revitalizing vacation. Sounds like no fun, right? When you have 12 hours to kill on an airplane, a lot of people's favorite way to kill time is to throw back a few drinks. When you're 30,000 feet high, the stale air on the plane already puts you in a dehydrated state. Unfortunately, alcohol not only adds extra calories (don't you want to fit in that bikini? ), but it also parches your body, putting you further into a dehydrated state. "Being dehydrated worsens the physical symptoms of jet lag…and alcohol…can disturb your sleep," according to Harvard Medical School's Family Health Guide. Another Harvard Health Publication in Healthbeat goes on to say that "alcohol promotes dehydration, which worsens the symptoms of jet lag." Make sure to drink lots of water before, during and after your flight to keep you hydrated. Once you get to your destination, drink plenty of water, and only then indulge in that piña colada you've been craving. It's important to start treating your internal clock as if you were in your projected time zone at least three days before your trip. Set your watch to your new time zone. According to 2015 Harvard Health Publication, you should "gradually move mealtimes and bedtime closer to the schedule of your destination." If you are moving forward in time, try heading to bed earlier and changing your eating habits to reflect that new time zone. If you are traveling west, try staying up a few extra hours to ease yourself into the new time zone. Sitting in a cramped airplane seat for hours on end wreaks havoc on your body. Backaches, tight hips and swollen feet are just a few of the terrible side effects of travel. To combat these dreaded side effects, it's important to mobilize and stretch before, during and after your flight. Do some deep lunges for your hips, cobra pose for your back and lots of sun salutations to get your blood flowing. Also, try to bring a lacrosse ball or foam roller (if it fits) to activate blood flow in the body. Dig a lacrosse ball into your lower back and hips to break up any muscle tissue that has tightened over time. For other travel tips and tricks, check out the above video from Mobility WOD founder, world-renowned CrossFit coach and physical therapist Kelly Starrett. Intermittent fasting has been proven to help set your body clock. On the day of your flight, try to have a healthy breakfast with plenty of good fats, fresh vegetables and lean protein -- think eggs with spinach and avocado. Once you're on the plane, limit your food intake as much as possible. Steer clear of sugars and carbohydrates that can spike your blood sugar and cause you to crash. According to the Argonne Anti-Jet-Lag Diet, a diet created by biologist Charles Ehret, fast days should "help deplete the liver's store of carbohydrates and prepare the body's clock for resetting." A 2008 study from Beth Israel Deaconess Medical Center shows that "if animals have access to food only during their normal sleep cycle, they will shift more of their circadian rhythms to match the food availability." Depending on what time you reach your new destination, there are ways to keep the body awake or help ease it to sleep based on what food you consume. If you land in the morning, eat lots of fresh vegetables and lean protein throughout the day to keep your body going. Then at night, eat a meal reach in carbohydrates so that you crash afterward. If you land at night, eat a meal rich in carbohydrates so you can enjoy a restful night's sleep. According to the Argonne Anti-Jet-Lag Diet, you feast because "high-carbohydrate suppers stimulate sleep." See it as a way to guiltlessly eat that pasta dinner you've been craving. Not too bad, right? The Art and Science of "Cheat Meals"
Once in your new time zone, lace up those sneakers and set out for a run or walk around town. Exercise helps acclimate the internal body clock, or circadian rhythm. In conjunction with a 2012 study published in the Journal of Physiology, author Christopher Colwell says, "It is evident that exercise will help to regulate [body clocks]." Prior to departing on your trip, exercise in the morning before work because light is a huge factor in regulating your body clock. Then, when at your destination, force yourself -- despite how tired you may be -- to work out in your new destination. This doesn't have to be an intense CrossFit workout, but it can be a walk or light jog just to get the body moving. This may seem like a big, fat "duh," but light and darkness play a huge role in our circadian rhythm. Planes can be noisy and bright, but if you can shut out the world and make time to sleep without any interruptions by using a night mask and earplugs, it can help your body tremendously. You might try a night mask developed by Stanford researchers, which claims to prevent jet lag by emitting a small light while you sleep. Our bodies respond to light and dark through our circadian rhythm (aka your inner clock). According to a 2009 study, researchers at Brigham and Women's Hospital at the University of Michigan (who developed the anti-jet lag app, Entrain) noted that "Timed light exposure is a well-known synchronization method, and when used properly, this intervention can reset an individual's internal clock to align with local time. The result is more efficient sleep, a decrease in fatigue and an increase in cognitive performance." Furthermore, according to Harvard Health Publications, it's best to "use the sun to help you readjust. If you need to wake up earlier in the new setting (you've flown west to east), get out in the early morning sun. If you need to wake up later (you've flown east to west), expose yourself to late afternoon sunlight." You can even try this method before departure based on the time zone you will be visiting. If you land in a place and need to stay away, go outside, open windows and seek light. If you need to go to sleep, using a night mask is your best bet. Melatonin is a hormone naturally found in your brain that helps control your sleep cycles -- specifically when it's time to go to sleep. When you travel, your sleep cycle and sleep times are thrown off by the time zones and change of light. By supplementing with melatonin, you tell your body that it's OK to go to sleep and your brain recognizes that it's OK to rest. According to a 2009 review done at the Cochrane Common Mental Health Disorder Institute, researchers reported, "Melatonin is a pineal hormone that plays a central part in regulating bodily rhythms and has been used as a drug to realign them with the outside world…. It should be recommended to adult travelers flying across five or more time zones, particularly in an easterly direction, and especially if they have experienced jet lag on previous journeys." And Harvard Health recommends typical dosages from 3 to 5 milligrams. Do you travel a lot? 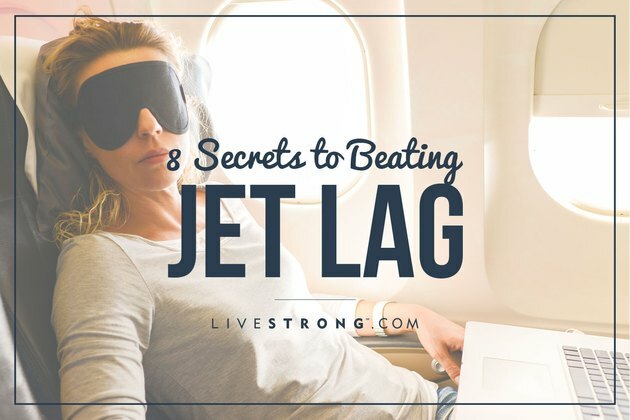 Have you ever suffered the ill effects of jet lag? What are your favorite ways to leave jet lag in the dust? Have you tried any of the ones on this list? Which ones worked? Which ones would you add to the list? Share your stories and suggestions in the comments section below to help out your fellow LIVESTRONG.COM travelers. Does Melatonin Make Depression Worse?